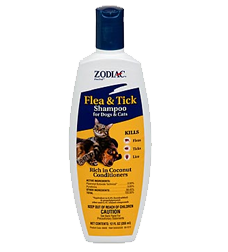 Zodiac Flea & Tick Shampoo Kills fleas, ticks, and lice Fresh-scented formula For use on dogs, cats, puppies, and kittens. 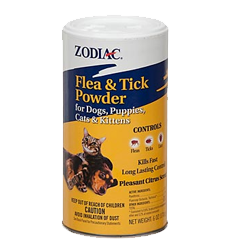 Zodiac Flea & Tick Powder for Dogs, Cats, Puppies & Kittens A dry alternative to topical sprays Controls fleas and ticks Convenient shaker top for easy application Ideal for multi-pet households For use on dogs and cats. 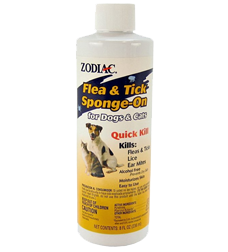 Zodiac Flea & Tick Sponge-On for Dogs & Cats Sponge-on for fleas, ticks, lice, and ear mites Alcohol-free and non-drying Concentrated formula. 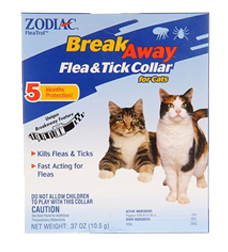 For use on dogs and cats. 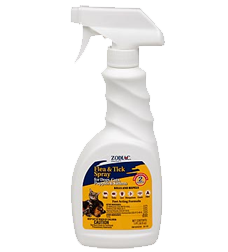 Zodiac Flea & Tick Spray for Dogs, Cats, Puppies & Kittens Dual-action spray contains an adulticide which kills and repels fleas, ticks, and mosquitoes Contains (S)-Methoprene Insect Growth Regulator (IGR) to kill flea eggs for up to 2 months For use on dogs, cats, puppies, and kittens. 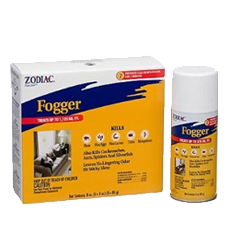 Zodiac Fogger Dual-action formula provides the quickest, easiest, and most economical way to treat the indoor environment Kills fleas, ticks,cockroaches, ants, spiders, mosquitoes, and silverfish Kills flea eggs and flea larvae for up to 7 months Convenient triple pack treats up to 2,250 sq. 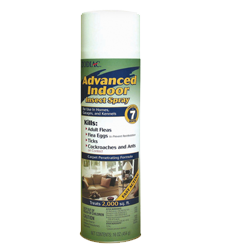 ft. Leaves no lingering odor For use in homes, garages, and kennels. 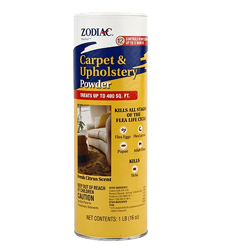 Zodiac Carpet & Upholstery Powder Provides long-lasting flea and tick control in the home Contains Nylar Insect Growth Regulator (IGR) to kill flea eggs and flea larvae Provides protection for up to 12 months Treats up to 400 sq. ft. Fresh citrus scent. 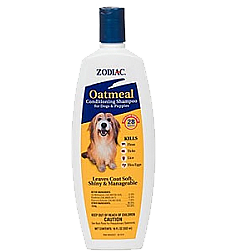 Zodiac Advanced Indoor Insect Spray Triple-action formula contains two adulticides to quickly kill fleas and ticks Contains (S)-Methoprene Insect Growth Regulator (IGR) to kill flea eggs and flea larvae Provides protection for up to 7 months Easy to apply aerosol spray 16 oz. treats up to 2,000 sq. 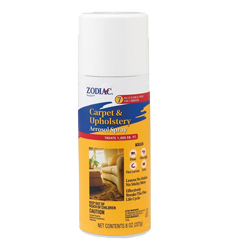 ft.
Zodiac Carpet & Upholstery Aerosol Spray Kills fleas, ticks, flea eggs, and flea larvae (Biting fleas in 10 minutes) Provides protection for up to 7 months Features a unique inverted applicator for quick and convenient flea and tick control Water-based formula leaves no odor, sticky mess or stains Treats up to 2,000 sq. 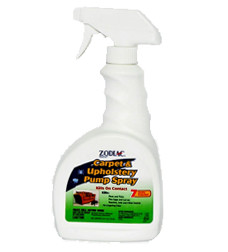 ft.
Zodiac Carpet & Upholstery Pump Spray Kills fleas, ticks, roaches, ants, earwigs, silverfish Kills flea eggs, and flea larvae for up to 7 months Features an ergonomically-designed handle for easy application. Leaves no visible residue Treats up to 300 sq. 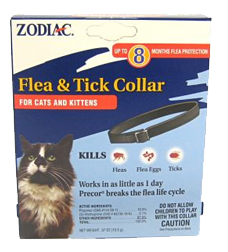 ft.
Zodiac Breakaway Flea & Tick Collar for Cats Kills fleas and ticks for up to 5 months Features a unique, patented safety design minimizing risk of injury Molded buckle reduces risk of neck irritation and buckle failure. 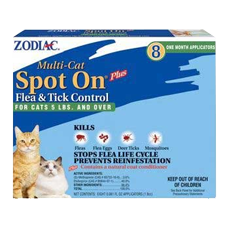 Zodiac Spot On Flea Control for Cats & Kittens Special formula Kills flea eggs for up to 1 month to prevent reinfestation Pet Specifix applicator shape helps prevent misapplication on dogs Longer applicator tip for easy application to long-haired cats 4 month supply. Weight specific formulas also available.